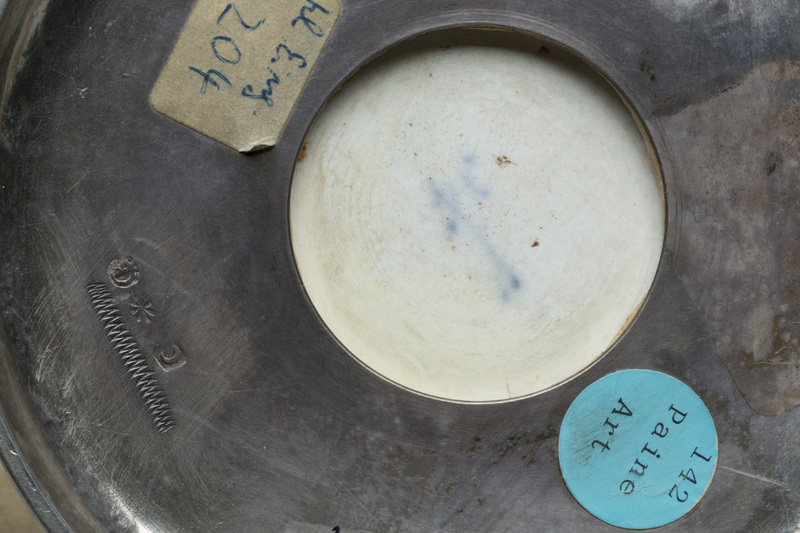 Last month, we demystified tin-glazed earthenware while putting it into a historical context. This month, we’ll figure out the magic behind the material that tin-glazed earthenware attempted to fill in for: porcelain. Introduced to Europe from China in the fourteenth century, porcelain was the most elegant and fascinating of materials. It was pristine, white yet translucent, and although it was thin and light-weight, it was also amazingly strong and durable. In other words, it was everything that tin-glazed earthenware and stoneware was not. As you might expect, porcelain imported to Europe were very expensive. To reflect its cost, and because it came in vessel shapes that were not used in the West, nobles would buy Chinese porcelain and then mount them in elaborate fittings made of precious metal. Porcelain was such a sought after material that it was called “White Gold.” The demand was so great that wealthy European collectors started a search to find the secret to making it. It wasn’t easy. True, hard-paste porcelain requires the inclusion of a special clay called kaolin. But the craftsmen attempting to make it did not know this, so their process was trial and error, using different types of clay in various proportions and fired at a number of temperatures. To further confuse the issue, there is another type of porcelain, which is called artificial or soft-paste porcelain. Soft-paste porcelains mimics real porcelain by using white clay mixed with ground glass to make it more transparent–it does not have kaolin. The first soft-paste was developed in Florence, Italy, under the patronage of the Medici. Some of these ceramics were made between 1575 and 1587, but after this point the technique was abandoned. Production of soft-paste porcelain began again around 1700 in France. In England, a variation of soft-paste porcelain is bone china, which was developed by Spode in 1799 when bone ash was added to the ceramic, making it more durable and attractive. But our focus for this post is German drinking vessels, and it is to Germany that we return, and to one of the most important discoveries in European decorative arts history: how to make hard-paste porcelain. Kaolin, the special clay needed to make hard-paste porcelain, was finally discovered in Saxony in the late seventeenth century. Augustus the Strong, Elector of Saxony and King of Poland, was obsessed with porcelain and purchased large amounts of Chinese and Japanese examples for his palaces in Dresden. He even planned to have one castle, the Japanese Palace, dedicated to showing off his porcelain collections. But he, like so many rulers in Europe, wanted to be able to make porcelain, not just buy it. When Augustus took over the rule of Saxony in 1694, he promptly put a number of craftsmen to work on the problem. In 1709, J.F. Böttger, who originally was brought to the court as an alchemist (because gold gold was just as desirable as white gold), discovered the mixture required to make porcelain. In 1710, Augustus established the royal factory in Meissen. By 1713, the workers at Meissen were producing porcelain for his collection. Augustus tried to keep the process a secret, because it both raised his prestige among the rulers of Europe, and meant that he could sell works to other nobles and make some money from it. As a result, Meissen held a near monopoly on porcelain production in Europe for almost 40 years, although workers took the secrets to Vienna to found a factory in 1719. Then, in 1747, workers defected from Vienna and spread the knowledge throughout Germany. The basics of porcelain production are similar to those used with other ceramics: you can either mold a solid clay or slipcast a liquid clay. Then the object is fired at a low temperature to dry it out. Once porcelain could be made, it was necessary to figure out how to decorate it. The artist Johann Gregorius Höroldt came to Meissen from the rival Vienna factory and developed a process for enameling porcelain in the early 1720’s. The ware can be decorated under the glaze (usually with cobalt blue) or painted with bright enamel colors over the first glaze, with a second firing to fix the enamel. Porcelain can also be fired at high temperature without a glaze, which is called biscuit porcelain, or bisque. It was more expensive because imperfections could not be hidden under the decorative glaze. In the earliest years of production, only the best porcelain for the royal family was decorated by the Meissen factory itself. Everything else, called a blank, was sold to hausmalers who decorated in their homes, just as was the case with tin-glazed earthenware. Two types of porcelain wares were made by the royal factory. Sculptural figurines in porcelain were used to replace temporary sugar sculptures made for banquet table decorations (using a luxury like sugar for pure decoration was the ultimate in decadence). Tableware for serving and eating were also made in porcelain. 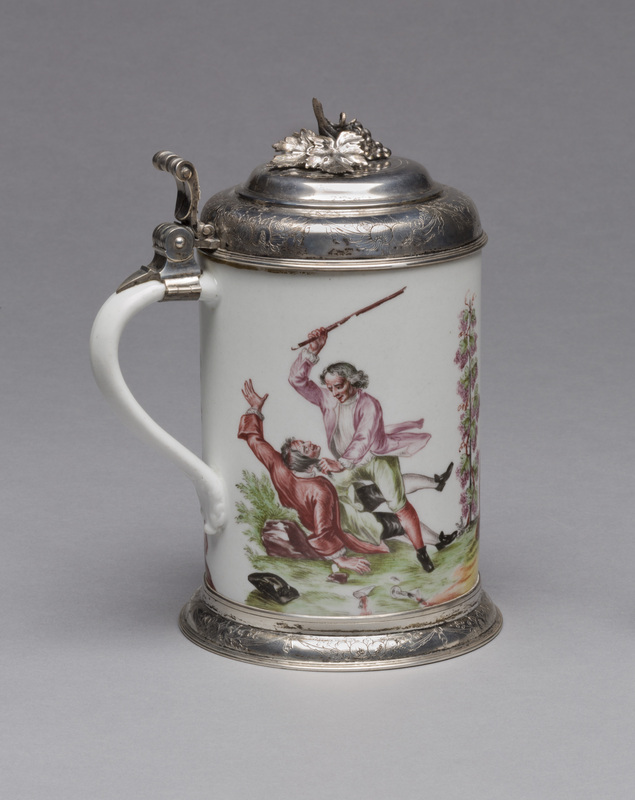 We are lucky enough to have two early Meissen tankards in the collection. They exemplify two different trends in early eighteenth century porcelain decoration. The first tankard (above images) has a finely-painted chinoiserie scene, which means that it takes its inspiration from Chinese art. A large group of people in Chinese dress and exotic animals take part in what looks like a formal ceremony of some sort, with musicians and a procession. The animals include monkeys and dogs that look suspiciously like dachshunds in sweaters. In the background is a harbor scene with buildings in the distance. The main scene is contained in a cartouche that is then surrounded by elaborate tendrels and flowers in gold. On either side of the main image are two smaller figures: on one side, a man smokes an opium pipe while a woman pours tea, and on the other a man interacts with exotic birds. 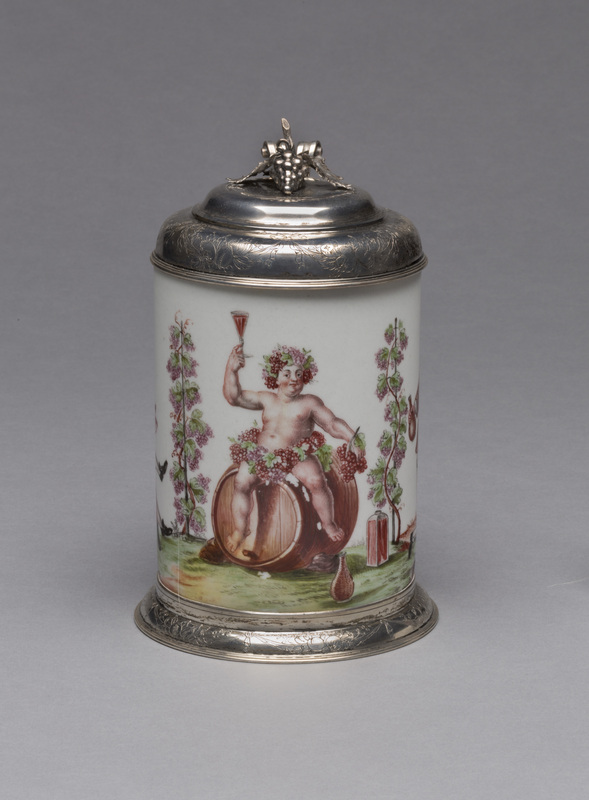 We know that in 1728, a number of tankards decorated like this were painted at Meissen by Johann Gregor Höroldt, with luster designs in the manner of Johann Freidrich Böttger. They were made for Augustus the Strong to send to the Russian imperial family in exchange for animals for his live menagerie. Although there is no way to know which tankards were included in that gift, it’s clear that the design was popular. 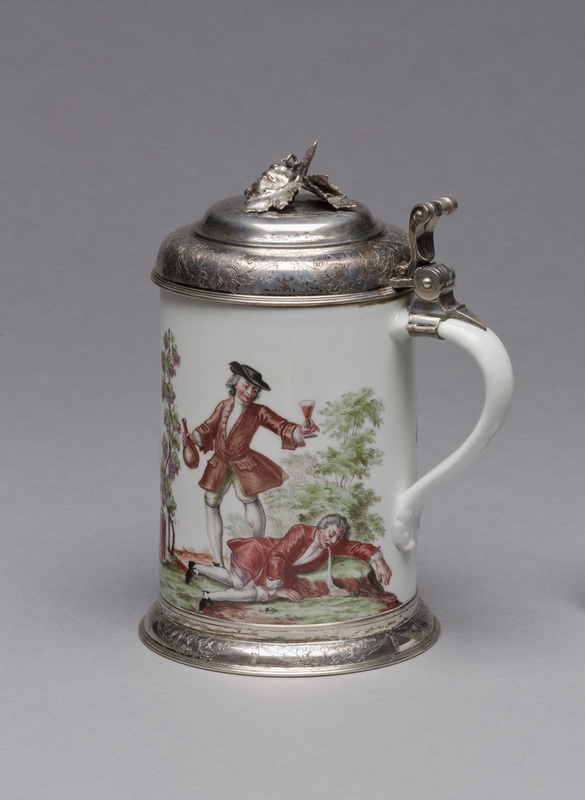 Other examples of tankards decorated in the style are in the collection of the Museum of Fine Arts, Boston, and the V&A in London. Some of Horoldt’s original drawings still exist. On either sides of the handle are scattered motifs from nature: bugs and shells. These were very likely taken from Joris Hoefnagel’s Archetypa Studiaque Patris Georgii Hoefnagelii, 1592, which was republished in the early eighteenth century. Meissen works of this date were known to have used elements from these prints, which were a treasure-trove of designs. Our second Meissen tankard takes its theme from the classical past. The god of wine, Bacchus, sits upon a barrel wearing only grape vines and lifts a glass of wine in salute to the viewer. For a vessel used to drink an alcoholic beverage, this is very appropriate. The other two scenes on this tankard, however, show the darker side of the bucholic rendering of the cheery god on the front. On one side, two men in eighteenth century dress fight violently. One beats the other with a stick, until his face is bloody. Two glasses, from the same set that Bacchus uses on the front, spill wine on the ground. The connection is clear: drinking can lead to violence. The other scene shows the same two men, one standing up holding a wine jug and holding out a full glass, while the other lies on the ground, vomiting. Again, a graphic representation of what too much alcohol will do! Although this must be a warning against over imbibing, it is also a visual joke. As far back as the seventeenth century, genre scenes showing drunken people were popular in northern Europe (this one is particularly illustrative of that!). As a testament to its quality, Meissen still produces porcelain today. Its reputation means that the distinctive mark of crossed swords in blue glaze has been copied by other manufacturers. First used in 1720, it is one of the oldest trademarks in existence. Now that we’ve seen how trade and technology led to the production of porcelain at Meissen, next month we’ll take a leap ahead to the nineteenth century to begin a look at our rich holdings in Mettlach steins and what they mean to Germany. Stay tuned! This entry was posted in Art, Curatorial and tagged German Art, meissen, porcelain. Bookmark the permalink. It’s fascinating how just one element – kaolin – changed the value of clay into true porcelain!